Yes, the 910 has no thread lace setting. I happen to also own a punchcard machine model # 892E (no idea why Brother chose to add the E to a punchcard model name). I remembered eons ago reading about someone on an Australian list actually getting a punchcard model carriage to work on an electronic machine. It is good to beware that not all carriages may be interchanged between different models, especially if the latter were manufactured several years apart. The magnet on the back of the electronic carriage is what trips the reader in the 910. With the 892 and 910 carriages side by side, I marked the approximate spot I wished the magnet to be. 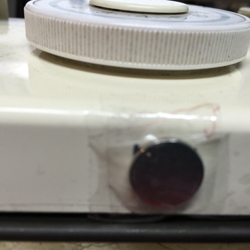 It is presently in place with cellophane tape for my tests. I believe it to be a “rare earth magnet”, 12 mm in diameter, part of a jewelry piece from days gone by, with a deep attraction to all KM metal parts. I used two cotton yarns, with a slight difference in weight. 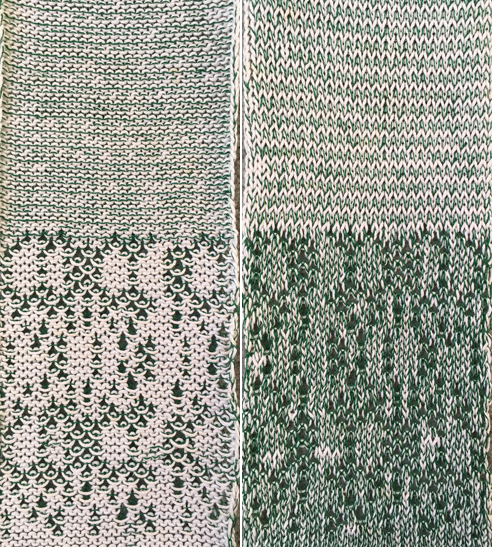 With the exception of when knitting transfer lace, the first instinct may be to use the color reverse option when the mylar repeats show lots of “white squares”. 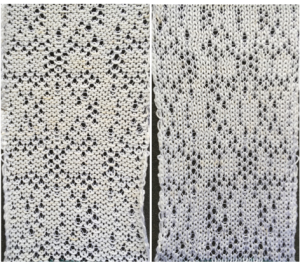 However, in this type of fabric blank squares knit both yarns; black squares or punched holes knit only the thinner yarn, while the heavier one floats behind it. 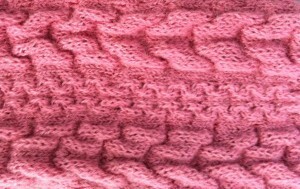 The KC tension used needs to accommodate both yarns easily knitting together. 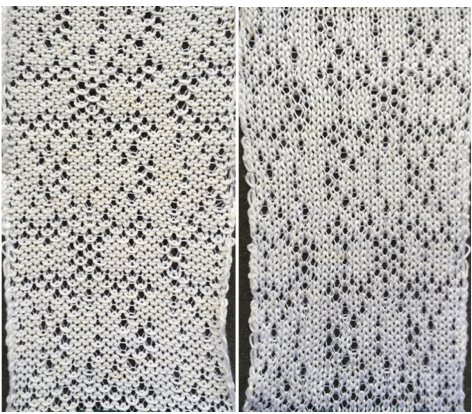 When only the thin yarn knits on selected needles, the stitches formed will actually be larger in size than those where both yarns knit together, giving the “illusion” of holes. This fabric was also at times referred to as punch lace. 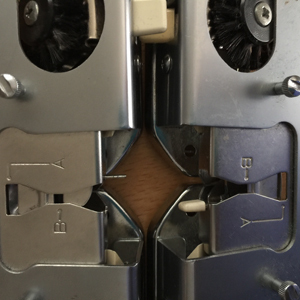 It is only possible in Brother machines that have 2 cam buttons in the center position, both center buttons under the MC/L mark are depressed. 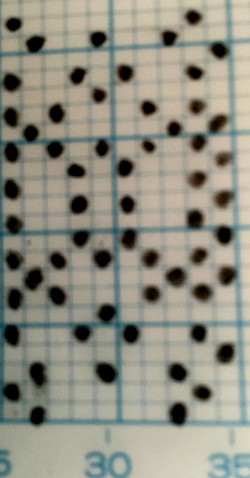 The punched holes/ black squares in mylar select needles that will knit in the fine yarn only. If you are using a very fine yarn for the second yarn, you may have to wrap it twice around the dial on the mast tension unit to control its feeding. Better edges are produced by canceling end needle selection or manually pushing any selected end needles back to B. If KCII is an option on later electronic models, some of the work is done for you. 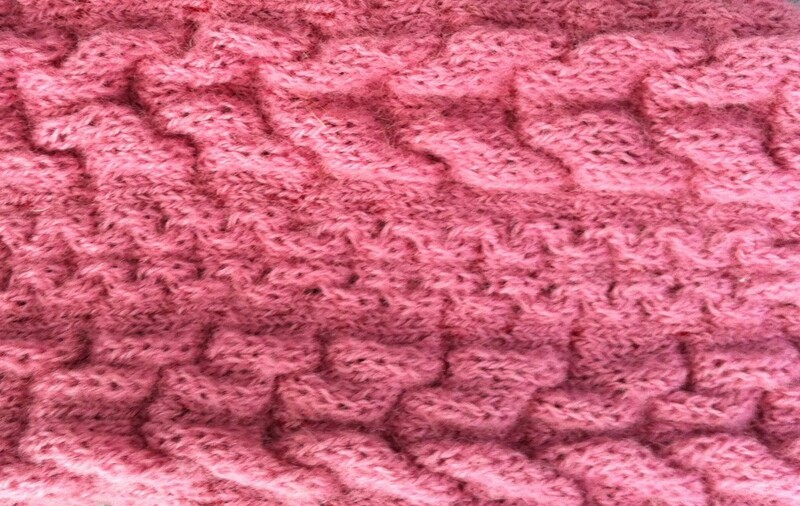 End needle selection may also happen as part of the design repeat, so in those instances, unless you are happy with the thin yarn only knitting on the very edge of the fabric, those needles need pushing back to B by hand as well. 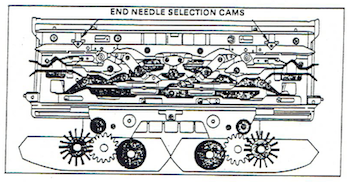 BTW: end needle selection must also be cancelled whenever patterning with needles out of work is used, or needles on both sides of out of work ones will produce knit stitches regardless of programmed pattern. I have always found the extra B gate on left more a nuisance than a necessity, particularly if the B yarn needs frequent changing.